Hi. 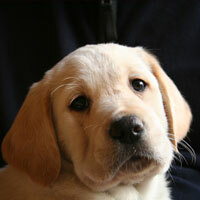 My name is Harry, I'm a Guide Dog Puppy in Training and this is my Blog. Harry supported Guide Dogs' appeal to equip the brand new training school for the North of England at Atherton. He was keen to help as he was to be one of the first puppies to train at the new school. Harry was at the launch of the appeal on 7th October 2008 where he got to meet the Press. One of the newspaper articles can be seen here. Harry has always loved mud and can always be relied upon to find the deepest, dirtiest and muddy ditch. 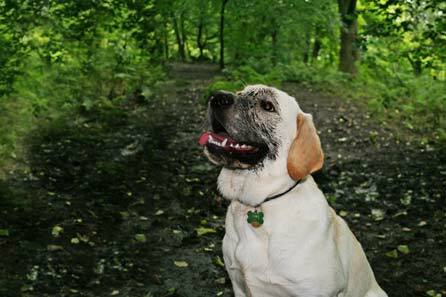 He perfected the art of snorkelling in mud way back in August last year, and ended up looking like this………..
Today, in preparation for Harry going off to training school, we took him out for another run with his soon to be kennel-mate Jenson. This time, instead of the park, we took them up on to the moors where they could run and explore together, instead of just running around on the grass. And of course, there were plenty of muddy ditches. Harry thinks the world of his new pal and thought it would be a good idea to teach him a few of his own bad habits. 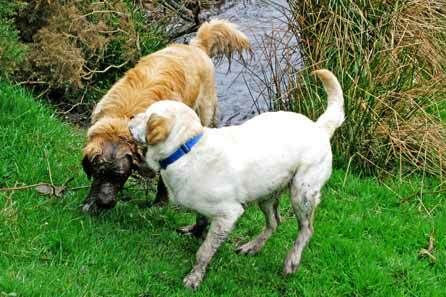 After finding the biggest and dirtiest of the ditches, he showed Jenson how to go snorkelling. Jenson was quick to learn and soon surfaced absolutely covered in mud. And for once, Harry decided to be Mr Goody Two Shoes and pretended to be horrified. Copyright ©2008 Liz and Steve. All rights reserved. XHTML | CSS | Layout uses YAML. Powered by Wordpress.